Join the EV Block Party! Join us on June 19th from 1:30p.m. 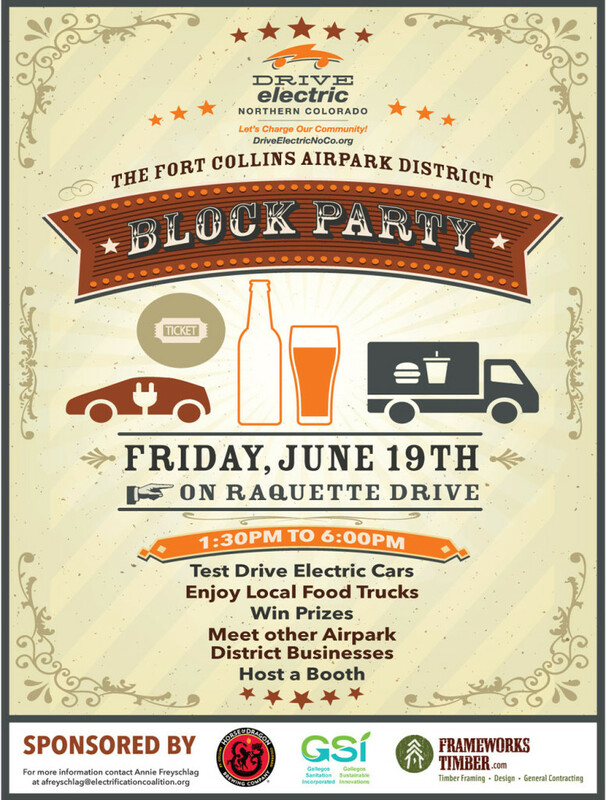 – 6:00 p.m. for an electric vehicle (EV) block party! Horse and Dragon Brewing Company, Frameworks Timber, and Gallegos Sanitation are joining together to host an EV Ride and Drive party for their employees, neighboring businesses and the public! The event will take place on Racquette Drive in Fort Collins, between Horse and Dragon Brewing Company and Frameworks Timber. We invite you to come test drive up to eight different EV models, meet local businesses in the Airpark District, and have some fun! After you test drive, be sure to enjoy a beer at Horse and Dragon Brewing Company! If you are a business located in the Airpark District (East of Lemay Ave, North of W Highway 14 ), you can have a table at this event to promote your business and network with other businesses! Contact Annie Freyschlag to reserve your space before June 5th Afreyschlag@electrificationcoalition.org or (970) 987-3055.